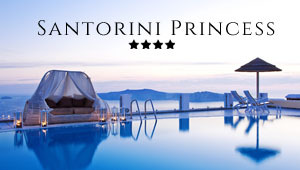 Akrotiri Santorini: Akrotiri is located next to the famous Red Beach. It is ampitheatrically built at the southeastern side of the island. Akrotiri was originally a Minoan settlement and today is one of the major tourist attractions and the most important archeological site of Santorini. The prehistoric town was destroyed due to a massive volcanic erruption around 1600 BC. Nowadays, the picturesque streets, the two-storey buildings, the lovely frescoes and plenty of tools witness the way of life in the prehistoric times. Today, the beautiful frescoes of the ancient city of Akrotiri can only be seen in the National Archaeological Museum of Athens. Some splendid houses are dotted around the village as well as a traditional windmill. Many tour boats arrive in Akrotiri and tourists are scattered to the nearby beaches of the area. Another place of interest is the Venetian castle that dominates the settlement of Akrotiri. The town has lovely hotels and also many local taverns with a splendid view to the sea. Akrotiri has plenty of churches to visit and one of the most beautiful is the church of Agios Nikolaos built right above the impressive redish rocks, on the way to the Red Beach.